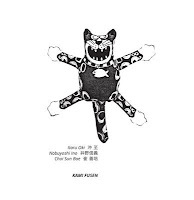 "Kami Fusen" is the second volume in the ongoing collaboration between NoBusiness and Chap Chap Records, after the excellent "The Conscience"by Rutherford and Toyozumi. This time, all the musicians come from the Far East: Itaru Oki was one of the first Japanese musicians to explore the free jazz idiom in the early Seventies; Nobuyoshi Ino comes from the same country and musical scene, even if he has often played in more traditional contexts; similarly, Korean trumpeter Choi Sun Bae has often worked in different, and often contrasting contexts. Kami Fusen (“Paper Balloon”) documents the concert held by the trio in 1996 at Cafè Amores in Hofu, Japan, and comprises inventive originals by Oki and Ino, as well as classic jazz standards like "I Remember Clifford"or "Tea for Two". "Pon Pon Tea" opens with busy bass lines in direct contrast with the theme's long unison lines, the trumpets soon engaging in a frenzied exchange of high register runs and brief interlocking melodic statements. Ino's trajectories are hard to anticipate, a muscular solo might lead to a tight walking bass to support the call and response of the muted trumpets, or dissolve in disjointed stuttering. Oki and Choi follow the lead with exquisite aplomb, always ready to ride the rhythmic flow or explore less familiar terrains. Ino's strong arco work delineates "Yawning Baku"'s structural frame, until the trumpets enter with a beautiful, relaxed unison theme leaning on an elongated bass vamp that gently pushes the piece forward. "Ikiru" is a sonic postcard from the outer limits of sound, all clanging and shrieking, with flute and bass slowly building a menacing soundscape, eventually leading to a lyrical double trumpet solo over bowed bass. "Kami Fusen" returns to the episodic, yet carefully crafted structures of the first pieces, adding unexpected latin flavors to the mix. "I Remember Clifford" is a solo trumpet showcase for Choi Sun Bae, his ability to work around the melody, delineating the theme just enough to be recognizable, on full display; while the duo of Oki and Ino approaches the final medley of "Old Folks" and "Tea for Two" with equal doses of respect and inquiry. In a sense, innovation is the only constant in the jazz tradition, despite the conservative tendencies of the mainstream, and Kami Fusen brilliantly embodies this contradiction, as the musicians approach the performance with evident affection for the jazz language without losing their adventurous edge.